Heavy, wet snow is affecting travel on I-90 in western South Dakota Wednesday. STURGIS, S.D. - Winter refuses to give up as another storm packing a lot of snow and wind began its assault on South Dakota Wednesday. Forecasters say the storm will bring heavy snow across most of the state before gradually ending Thursday. Breezy northerly winds will result in areas of blowing and drifting snow and significantly reduced visibility at times. Stronger winds are actually expected Thursday across the western South Dakota plains east of the Black Hills toward central South Dakota, resulting in zero visibility. The state DOT says blizzard conditions will more than likely make travel difficult if not impossible. As for snow totals, the heaviest snow is expected in the south-central portion of the state, where two feet of snow could fall. Most of western South Dakota is expected to see anywhere from 12 to 18-inches. Lesser amounts are forecasted for northwestern South Dakota and northeastern Wyoming. Governor Kristi Noem on Wednesday morning ordered the closure of state government offices in all 52 counties being affected by the storm. She says only essential personnel within state offices should report to their work stations after the closure. Many schools are closed today and no travel advisories are up for I-90 from the Wyoming line to Piedmont as well as Highway's 385, 85 and 14A in the Black Hills. 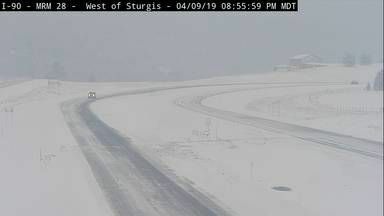 There are also no travel advisories on highways north of Belle Fourche and Newell and on Highway 34 east of Sturgis. Law enforcement is encouraging people to check road conditions if they have any travel plans today. The number is 5-1-1 or by visiting Safe Travel USA online.